Posted on Sunday, October 2nd, 2016 in Conservation, Kafue National Park, Travel. 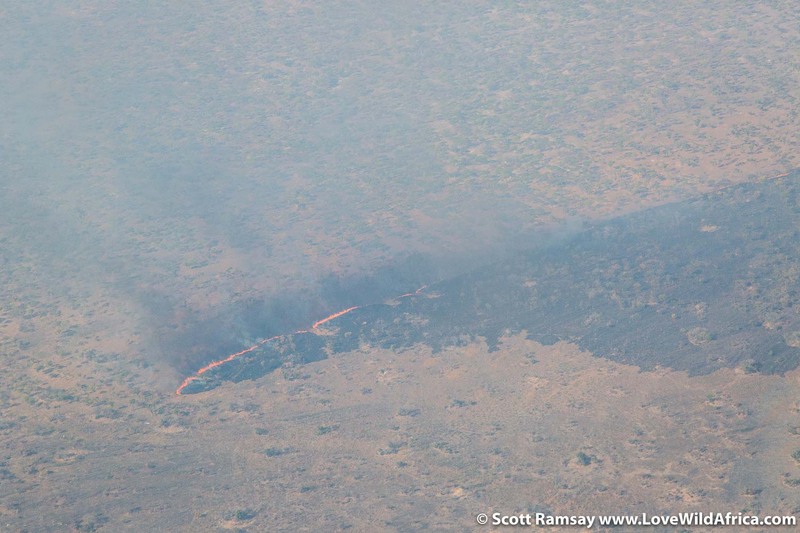 During the dry winter season, most of Zambia is on fire. Local people living in rural areas set the dry grassland alight, so that when the summer rains arrive, their cattle can graze on the succulent new growth. The smoke from the fires casts a drab veil over everything. It’s a thin grey soup that fills the air up to 3 000 metres. 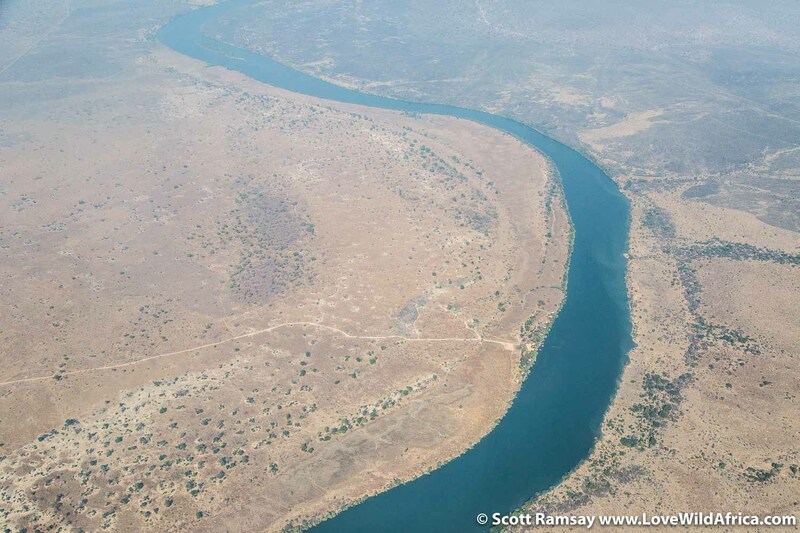 We were flying in a small four-seater plane from the town of Livingstone near Victoria Falls, and were headed north to Busanga Plains in the north of Kafue National Park. Our little plane bounced around on the thermals like a drunken bumblebee. 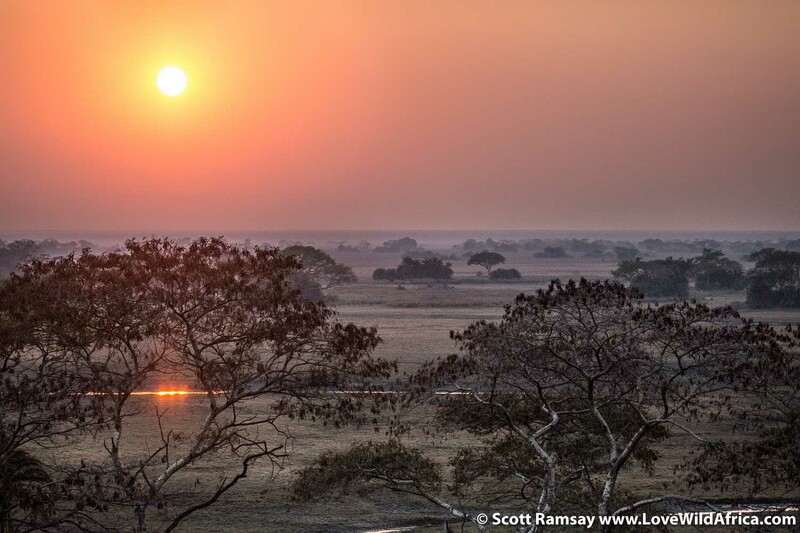 Kafue in central-west Zambia is just over 22 000 square kilometres. 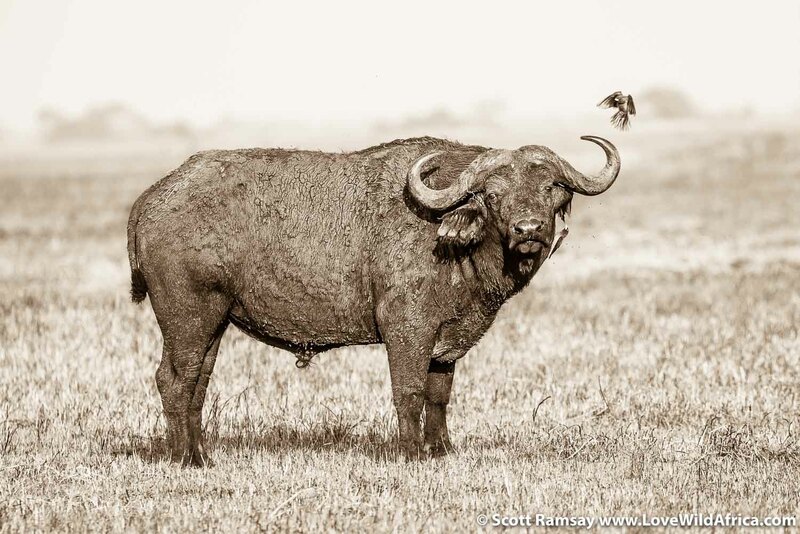 Created in 1924, it’s surrounded by so-called game management areas of another 43 000 square kilometres. At more than 6 million hectares, the area is one of the biggest wild places on the continent. Our flight was during the middle of the day. 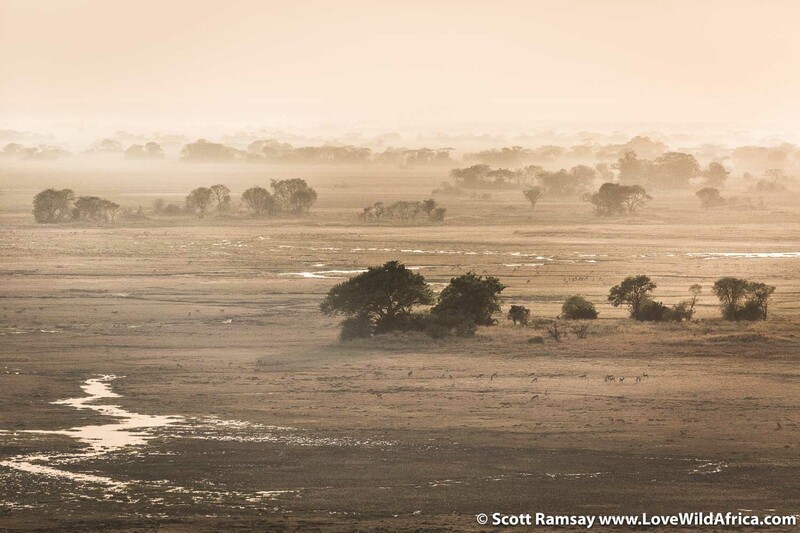 The hot sun and smoky air quickly evaporated any of the romance of flying low over an African wilderness in a small plane. The miombo woodland below seemed endless, even relentless; kilometer after kilometer of Brachystegia trees that had shed their leaves, waiting with unending patience for the summer thunderstorms that will arrive in November, when everything will turn verdant again. And then, as our bumblebee dropped down out of the dreary haze, Busanga revealed herself to us. I forgot about the heat, dust and smoke, and pushed my nose up against the small window and stared out, entranced. I’d heard good things about Busanga from others who knew her well. Her reputation was tantalizing, but this was unlike anything I’d seen before in Southern Africa. 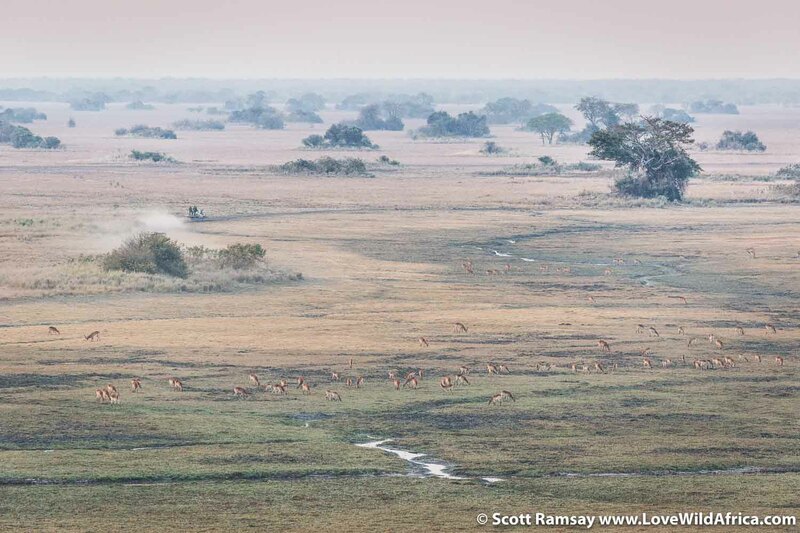 Extending for about 600 square kilometres, the grassy flats of Busanga are an exception to the rule of miombo woodland in Kafue. 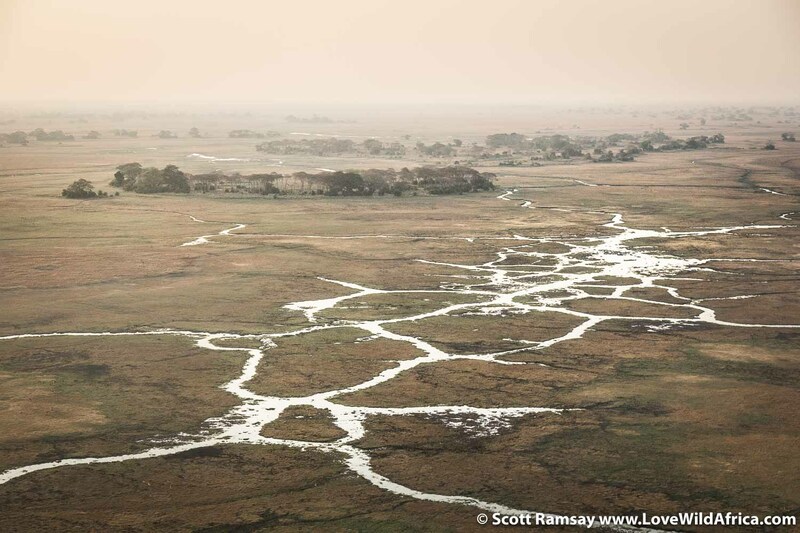 The Lufupa River, a tributary of the Kafue River, sustains the vast fertile grasslands in this northern sector of the park. In summer these plains flood, leaving only islands here and there. 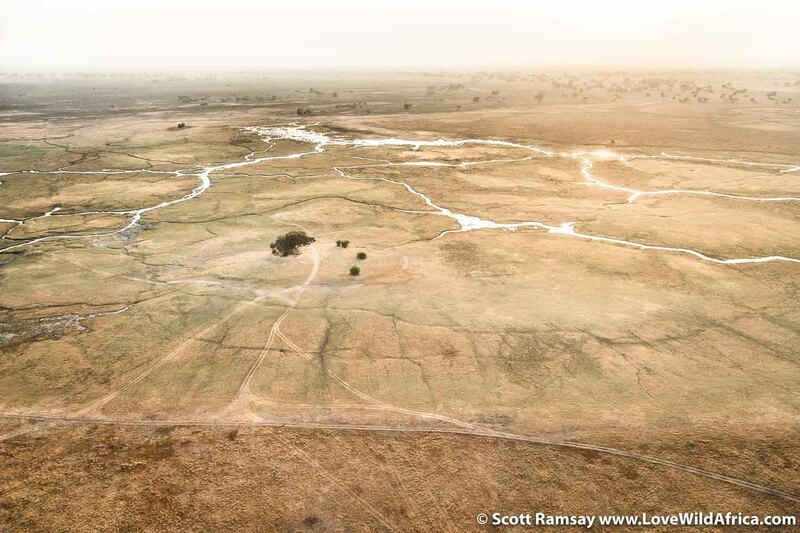 In winter, the waters recede to reveal massive open grasslands, known as “dambos”. 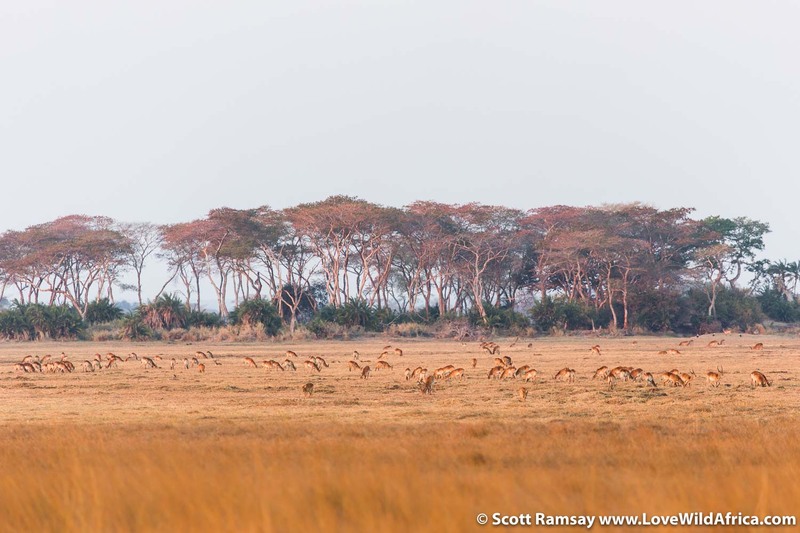 Like veins and arteries pumping blood through the body of a thoroughbred, the narrow water channels spread out across Busanga, where thousands (and thousands) of red lechwe and puku antelope come to graze. Within half an hour of landing on the small airstrip, and being plonked onto a game-viewing vehicle, we were surrounded by hordes of these antelope, which dotted the plains in huge numbers. 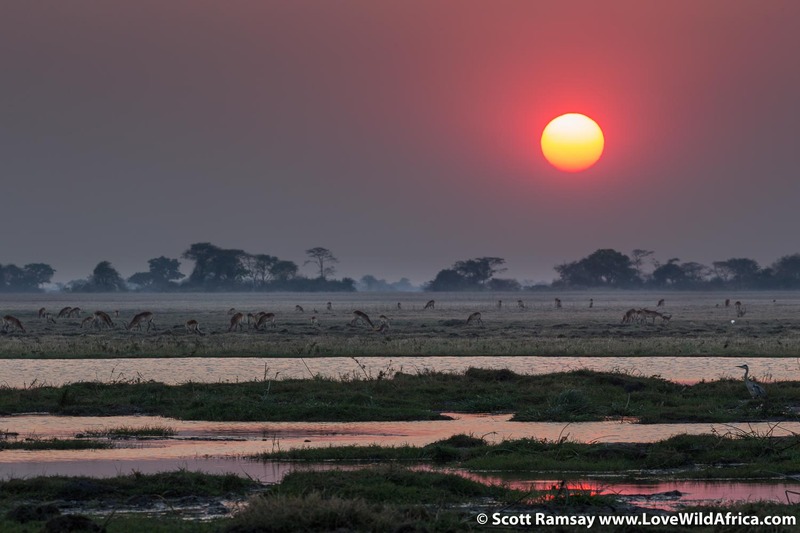 Kafue has 20 antelope species, the most of any park on the continent. 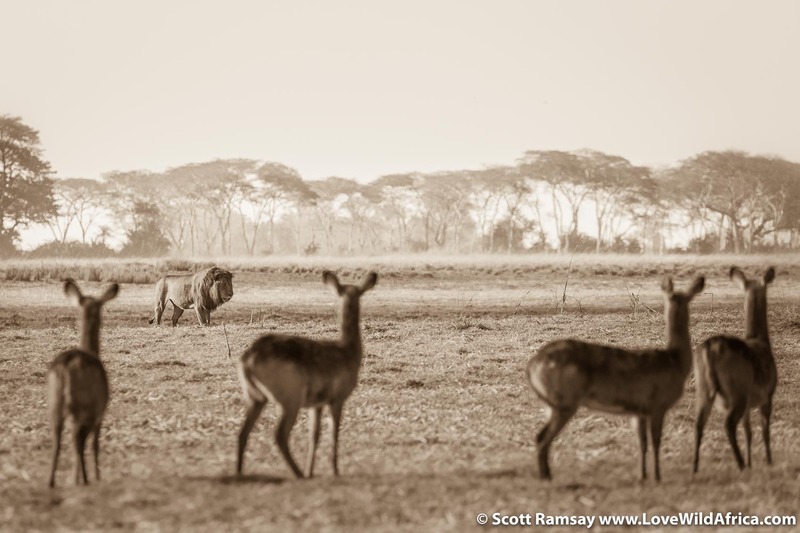 We drove past herds of sable and roan antelope, usually rare in Africa, but relatively common in Kafue. We spotted several groups of oribi, which surely get the prize for being the daintiest, prettiest of them all. Over the next few days, my guides Newton Mulenga and Isaac Kalio introduced me to the wonders of Busanga. 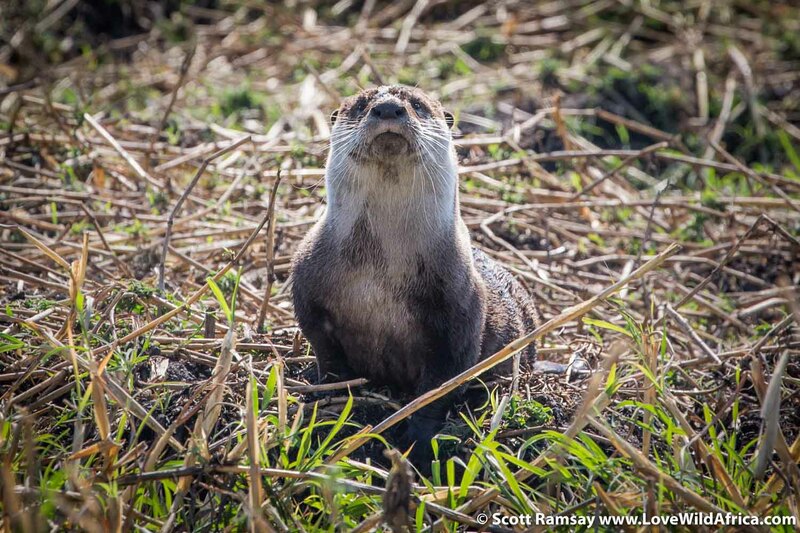 We found a Cape clawless otter foraging in a channel of water, near to two fighting hippos. 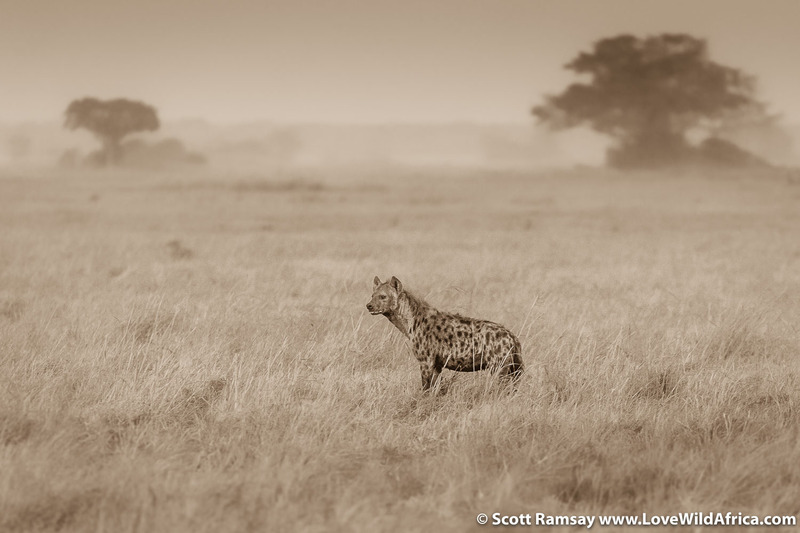 At dusk, a spotted hyena came cantering past us, intent on its nocturnal mission for food. 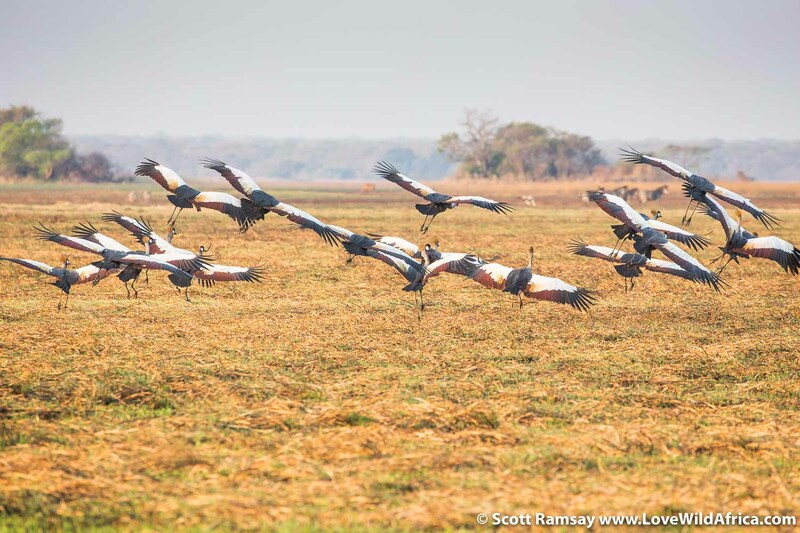 We regularly came across flocks of fifty or more crowned cranes, and several pairs of wattled cranes. 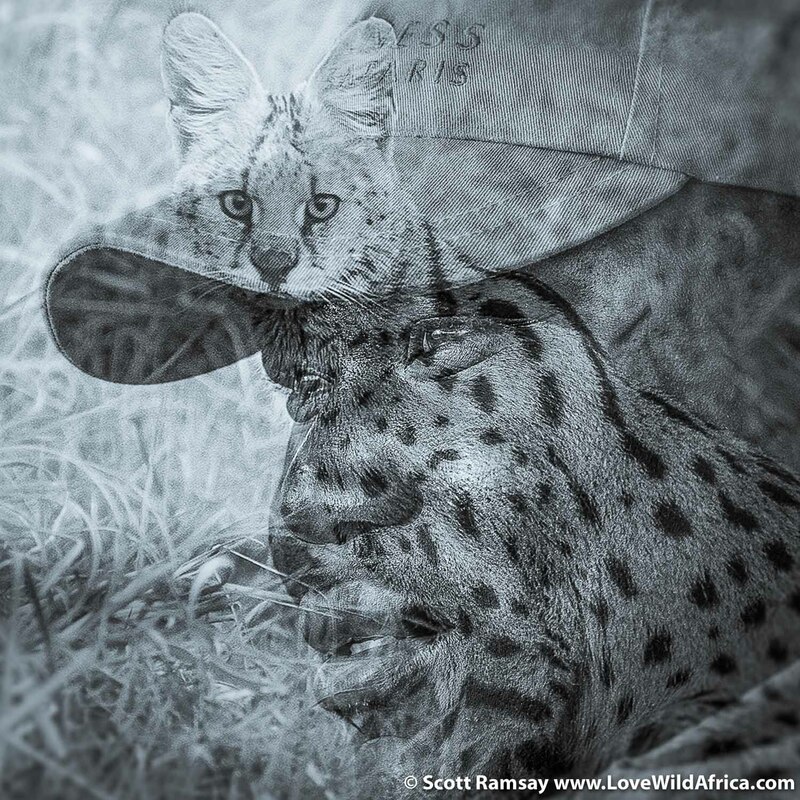 One evening, just after enjoying a cold beer under a blazing red sky, we saw a serval, stalking in the grass just thirty metres from us. We followed it and almost drove right past it, as it hunkered down. It stood up, scampered off, then stopped and looked back at us for a few seconds before melting into the blackness. And then there were the lions. 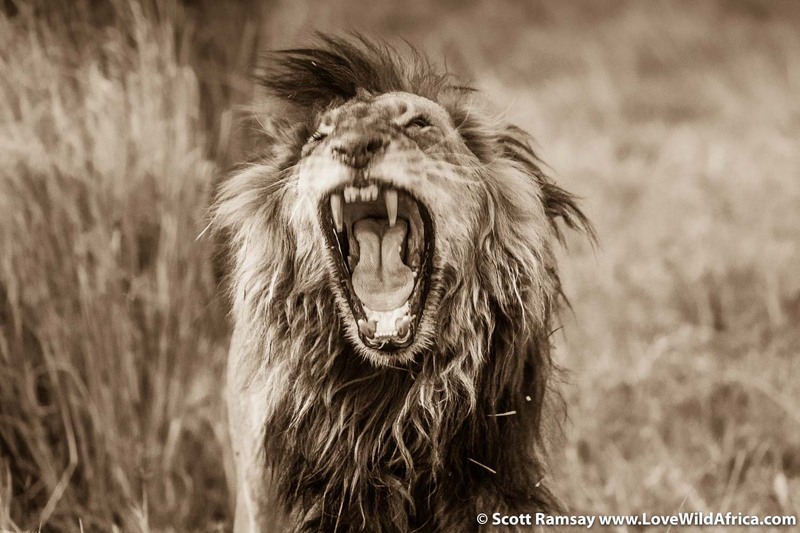 On the first morning at Busanga Bush Camp, the local pride passed through the unfenced camp. 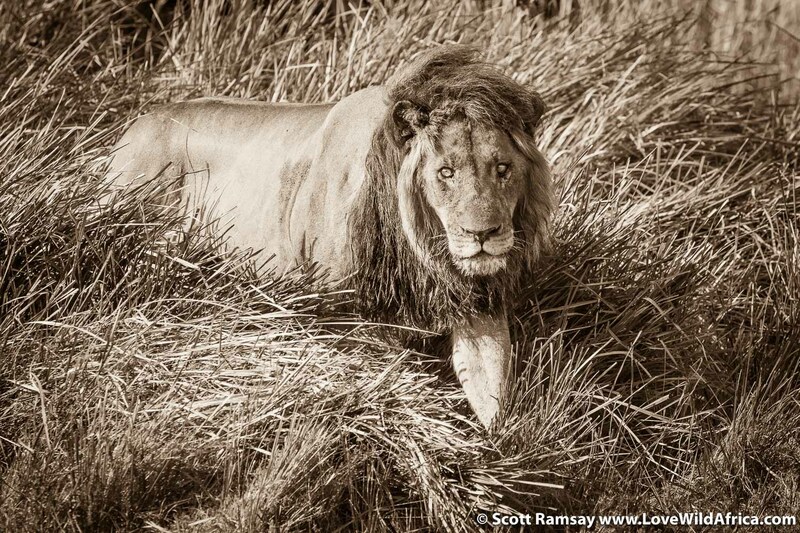 I didn’t see them, but as I walked out my tent, I could see fresh lion tracks everywhere on the soft, sandy substrate. Then I heard shouting and screaming. Soon after I learnt that two six-month old cubs had started scratching playfully on the canvas of one of the safari tents, to the consternation of the sleepy guest inside who got the fright of his life. The barrel-chested Newton came to the rescue, chuckling, shouting and waving his arms at the cubs, chasing them away. 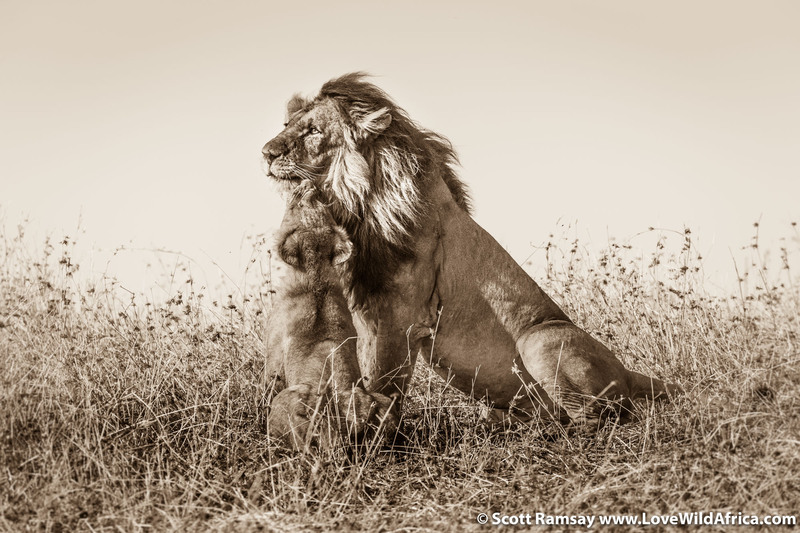 For two days we followed the pride across the plains as they crisscrossed their kingdom: two big males in their prime, plus a sensuous lioness and those same scoundrel cubs, which had scared the hell out of the poor guest in his tent. They were full of trouble, stalking their mom and the two big males, jumping on them and causing havoc wherever they went. My camera worked over time. 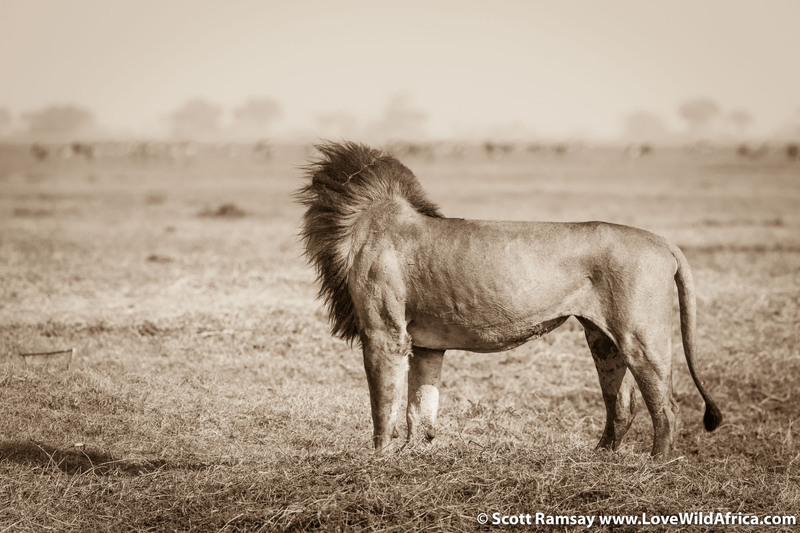 The lions posed like models at a fashion show, staring into the distance at the lechwe and puku which kept well away. 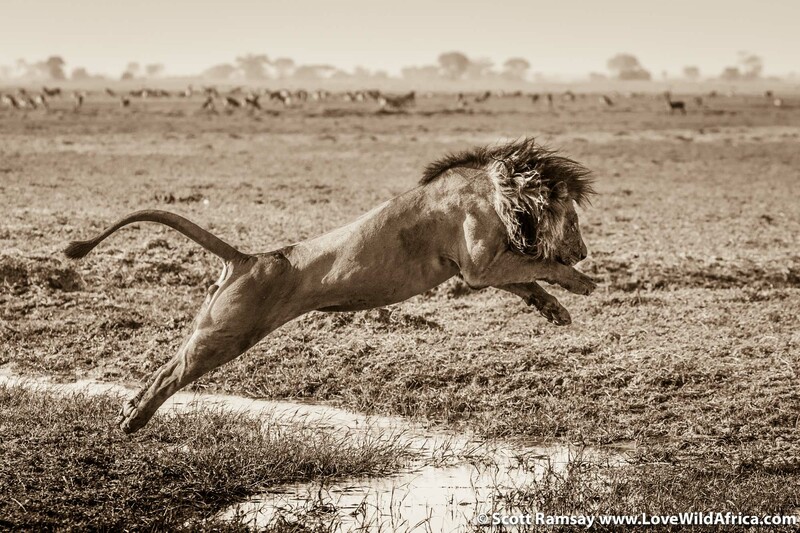 When the big cats came to the narrow water channels on the plains, they’d launch themselves through the air, manes flowing backwards, clearing the water like unlikely ballet dancers at an opera. 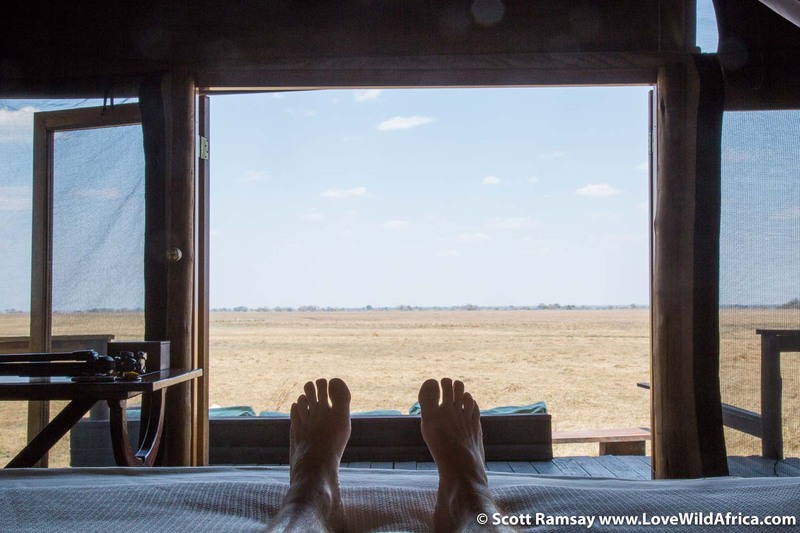 Busanga is breathtaking, mind-blowing stuff for anyone who loves Africa and its wildlife: the uncluttered horizons, the endless plains, the thousands of antelope and the jumping lions. We were alone mostly, and witness to all of it, with just one or two other game-viewing vehicles on the plains. 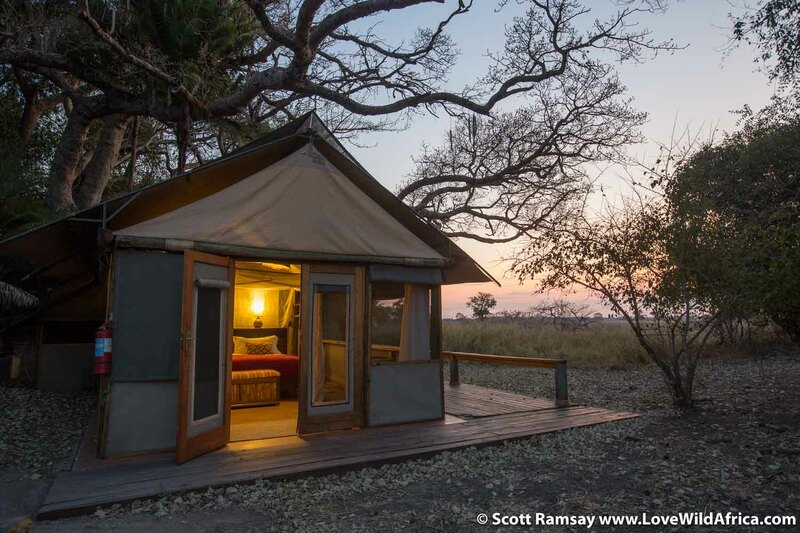 Wilderness Safaris operate two small, spectacular camps – the more basic, yet still comfortable Busanga Bush Camp and the larger, more luxurious Shumba Camp. (I prefer Busanga, as it’s smaller, simpler and more connected to the surrounding wilderness). The accommodation, food and service at both camps hits just the right note. 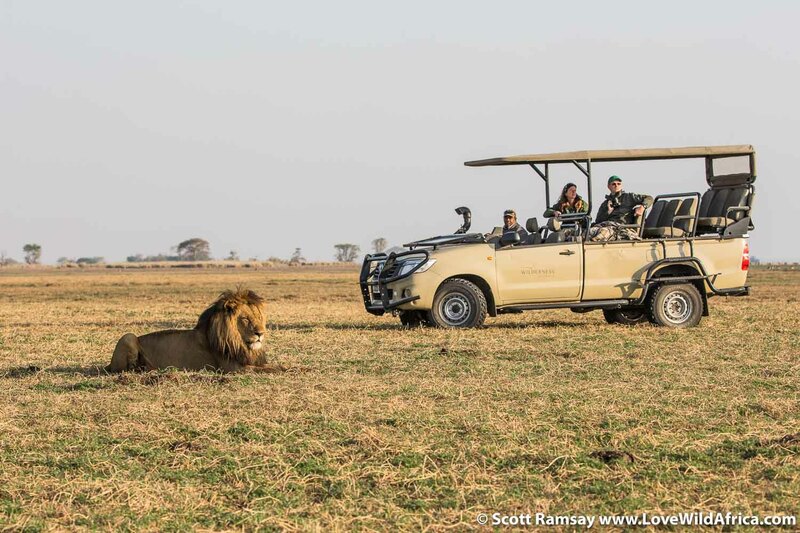 My guides – Newton at Busanga, and Isaac at Shumba – are brilliant : they love what they do, and they want nothing more than to share their wilderness with their guests. 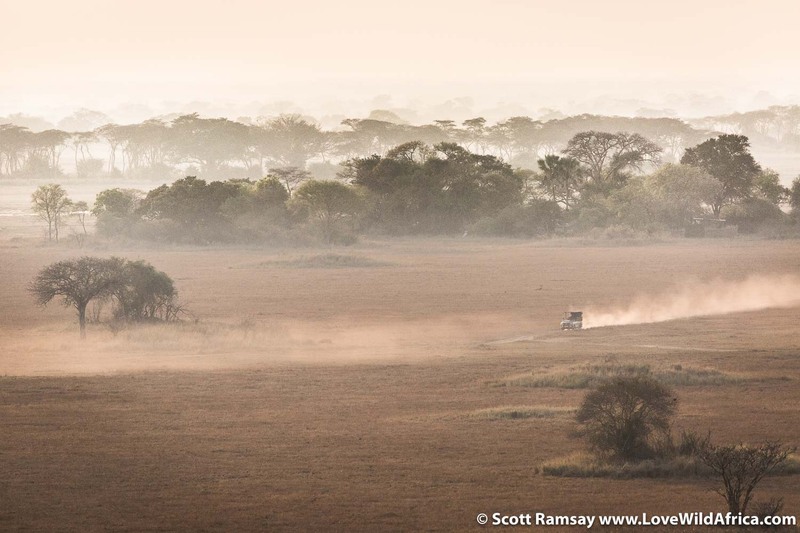 One morning, as the other vehicles headed back for breakfast after their morning drive, Isaac asked me whether I wanted to skip breakfast and stay with the lions. Of course! We ended up spending seven hours with the big cats. That’s how I like to spend my days: thank you, Isaac. After a day, I’d already resolved to come back here soon, to spend several weeks, perhaps months, absorbing Busanga into every cell of my body. I was spellbound. 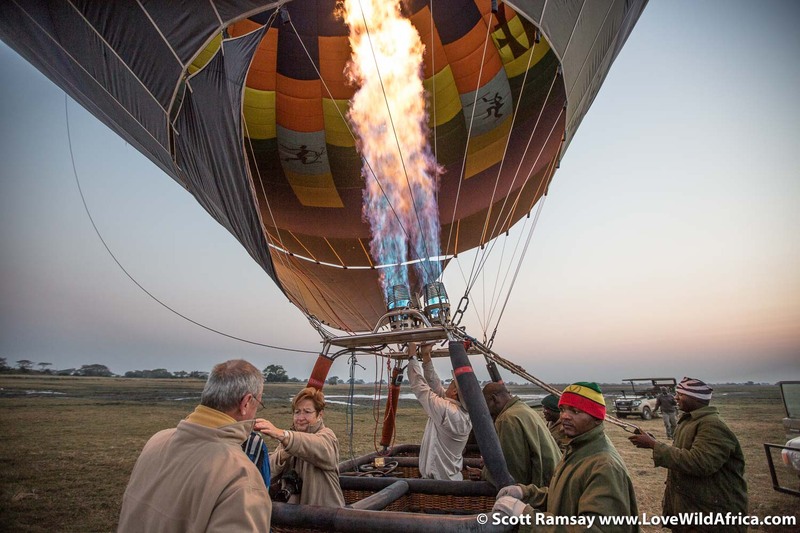 And then on the last morning, like some goofy, clichéd climax, we were whisked away into the sky on a hot-air balloon, floating low over the plains and the woodlands, where fish-eagles perched on the treetops, throwing their heads back as they called to their mates. Depending on the weather and the wind, all guests get a chance to ride on the balloon. You’re in safe hands. Owner and operator Eric Hesemans has been doing this his whole adult life, mostly in Namibia, but more recently in Busanga. Eric told me how he’d become good mates with famous Brazilian photographer Sebastiao Salgado, who a few years ago had flown with Eric over Busanga every morning for several weeks, taking aerial photographs. Salgado has spent the last few years documenting the wildest places on the planet. Busanga cleary made an impression. “Sebastiao loved it here,” Eric told me. Of course he did. 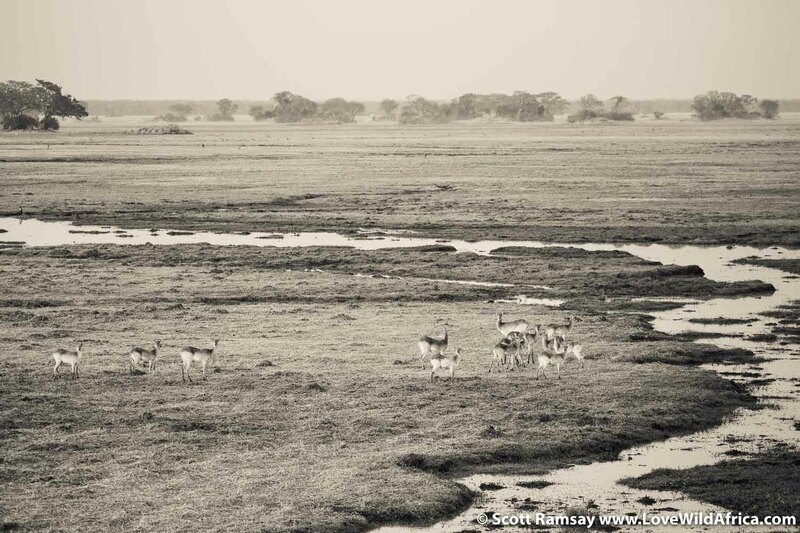 Below us, large pods of hippos grunted in the water channels, and all those lechwe and puku looked up at us. We were hovering so close to them that I could see the sunrise reflecting in their big amber eyes. As I write these words, I just want to be back in Busanga. But for all the serendipitous natural wonder of Busanga, this wild beauty is on a knife-edge. 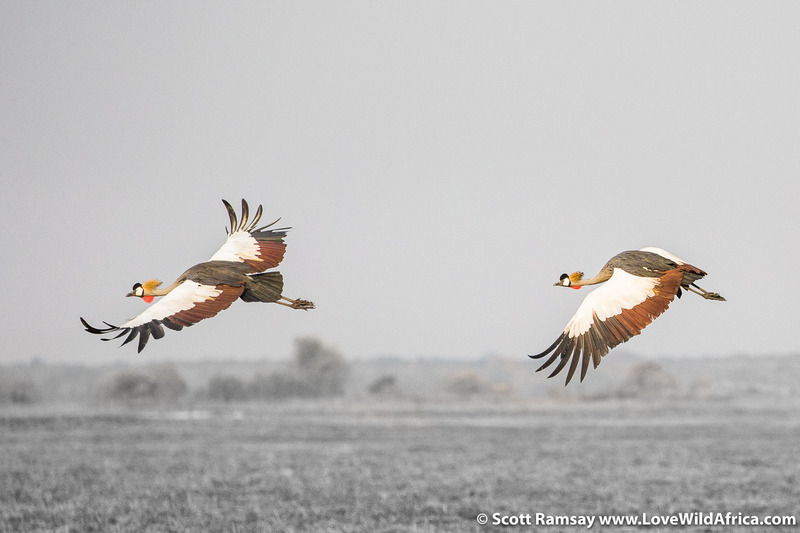 Like so many other wilderness areas in Africa, it’s wildlife and habitat face serious challenges. Throughout the days and nights while I was there, bush fires raged on the horizons. As part of their traditional fishing rights, locals are allowed into the park to fish in the rivers, and they set the land alight to rid lions of their cover in the grassland, and to keep elephants away. Satellite images show that up to 80% of the park burns ever year. (When the park was established, most of the Nkoya people were evicted from their land, and their fishing rights are a key source of livelihood and protein). 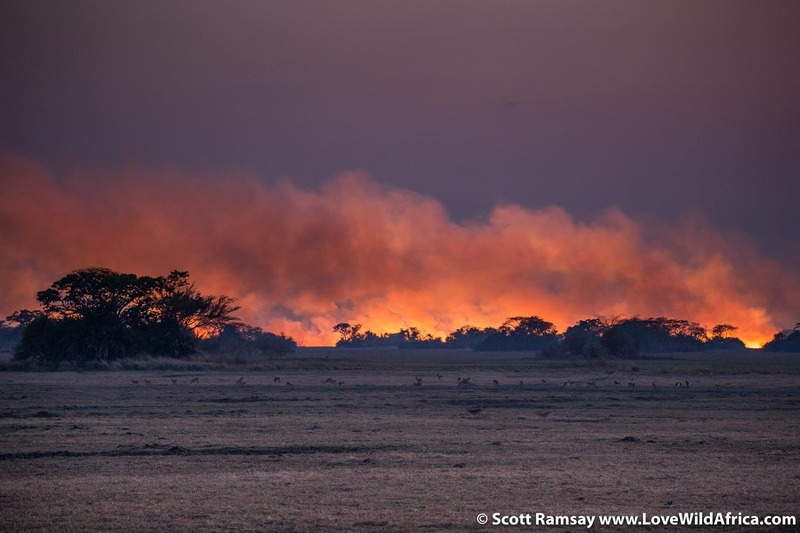 While fire is a necessary and natural ecological occurrence in savanna, if the land burns too often it can reduce species diversity, and eventually disrupt the balance of the whole system. Although the recent Great Elephant Census notes that Kafue’s elephant population may be one of the few that is stable or even increasing, poaching continues to be a serious problem, according to the guides. (In the 1960s, Zambia had about 250 000 elephants. 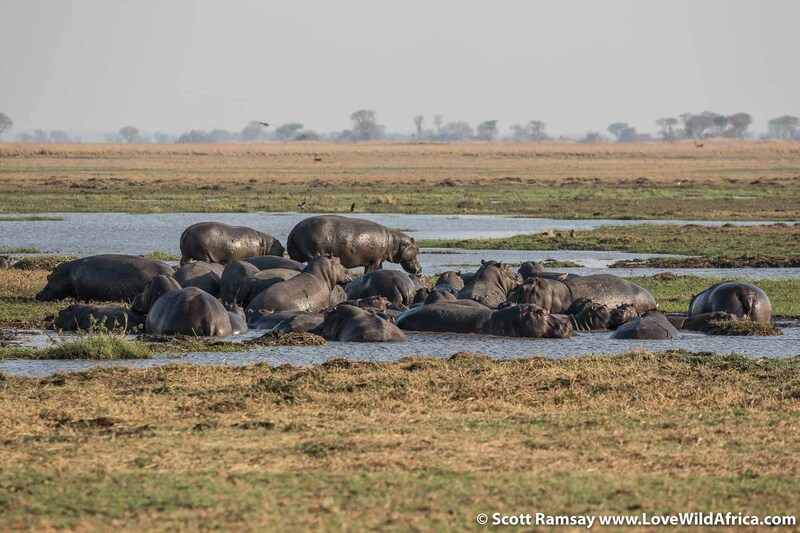 Today there are only 10 000 elephants, of which Kafue has about 2 300. Kruger National Park, similar in size, has about 17 000). We didn’t see one elephant in my (admittedly short) stay of four days, and very little evidence of their movements on the plains. An old dung ball here and there, but that was it. Apparently, when elephants do emerge from the miombo woodlands at sunset, they move quickly across the plains to drink at the rivers, and then head back into the safety of the trees long before morning arrives. And then there are the lions themselves. 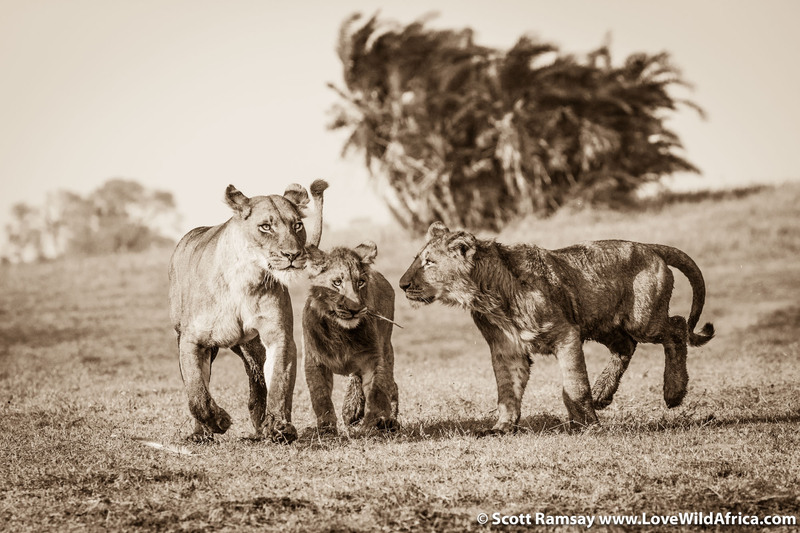 Increasingly, because of rampant bushmeat poaching by hungry people on the peripheries, the lions are inadvertently snared. Some survive, some die from the wounds and pain. I interviewed lion researcher Dr. Neil Midlane after my trip, and you can read my interview with him here. I had to leave Busanga after just a few days, but I didn’t want to. Even with the bushfires burning on the horizons, and the poaching problems, I get the feeling that there is much hope, that Busanga could be even more spectacular, if it receives the help it needs. 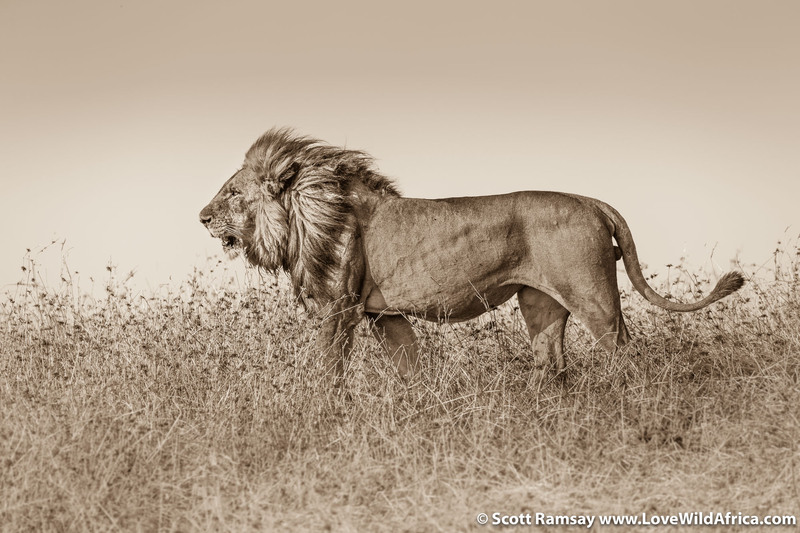 Like most other wilderness areas in Africa, there is so much to admire. 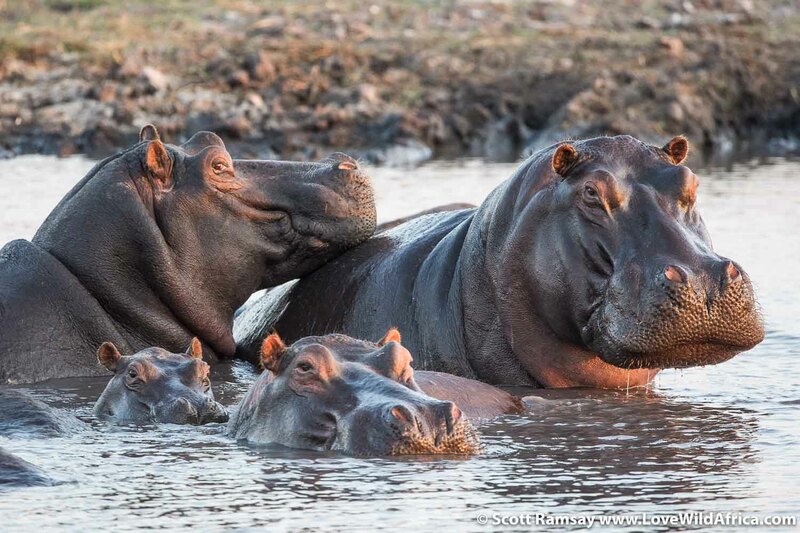 NOTE: From a conservation perspective, Busanga (and the rest of Kafue, although I haven’t explored all of it) is one of Africa’s finest wilderness areas. And from a photographic perspective, it ranks as one of my favourite places for wildlife photography. 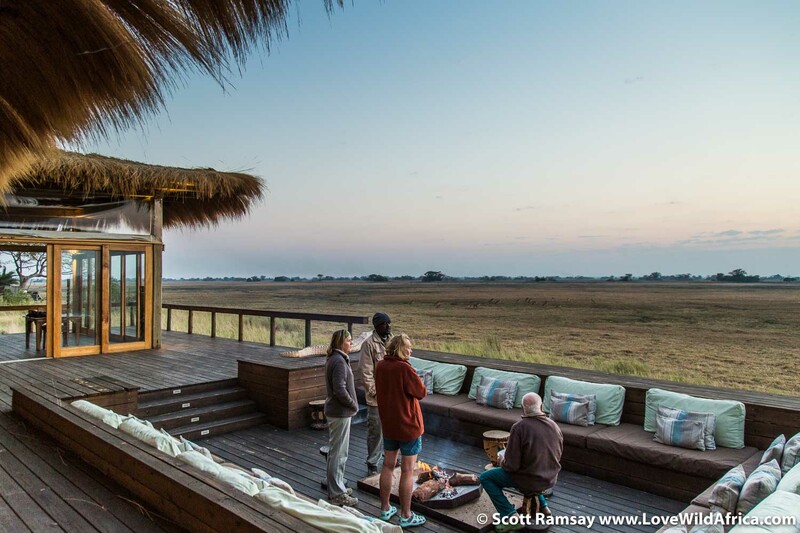 Wilderness Safaris deserve plenty of credit for investing in this remote, wild place. I can recommend Busanga Bush Camp and Shumba Camp to anyone who wants a unique, unforgettable wildlife safari. 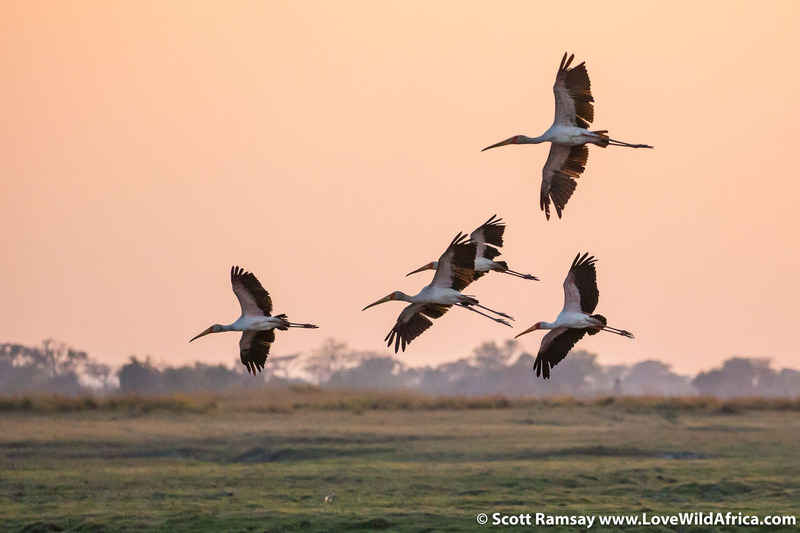 And by travelling there, you’re making a real difference to its conservation. The camps employ mostly local people, and a percentage of your money goes to anti-poaching operations in the area. 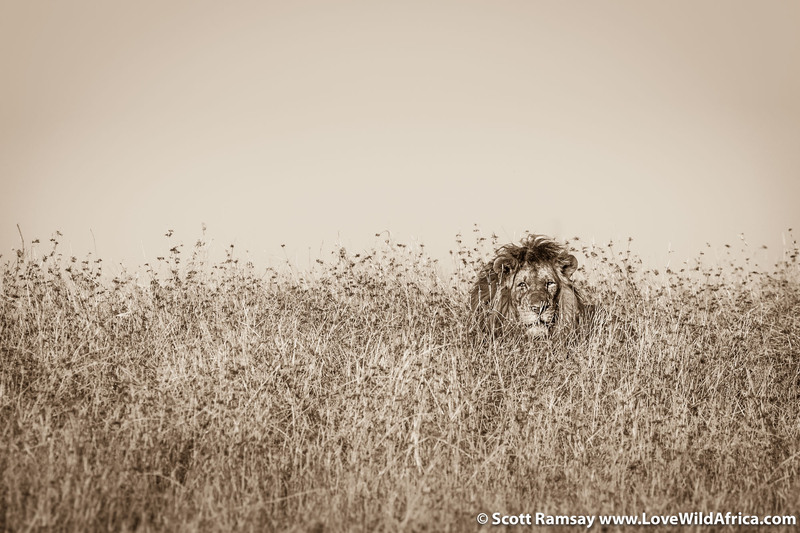 My first sight of a male lion in Busanga. How’s that flowing mane? How can anyone shoot an animal like this? Flying over one of the many water channels. 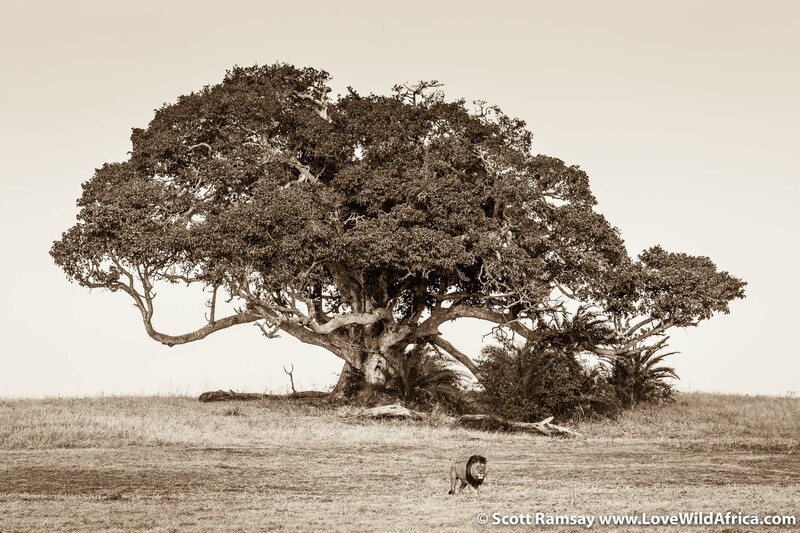 A huge sycamore fig tree dwarfs a male lion. 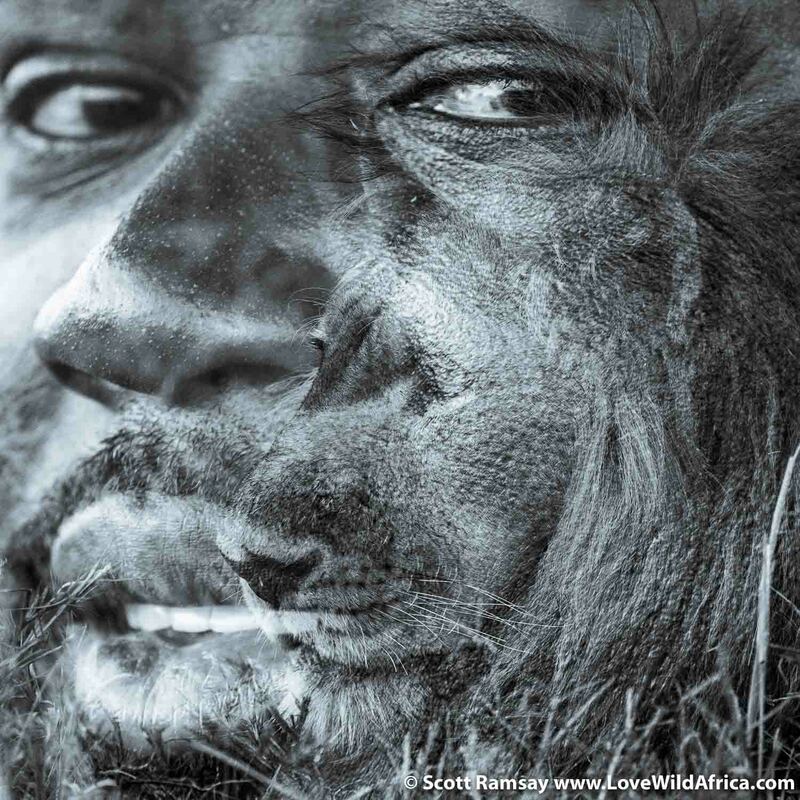 A hunter turned photographer called Francois d’Elbee wrote and photographed a beautiful book about Busanga, called simply “Busanga”. 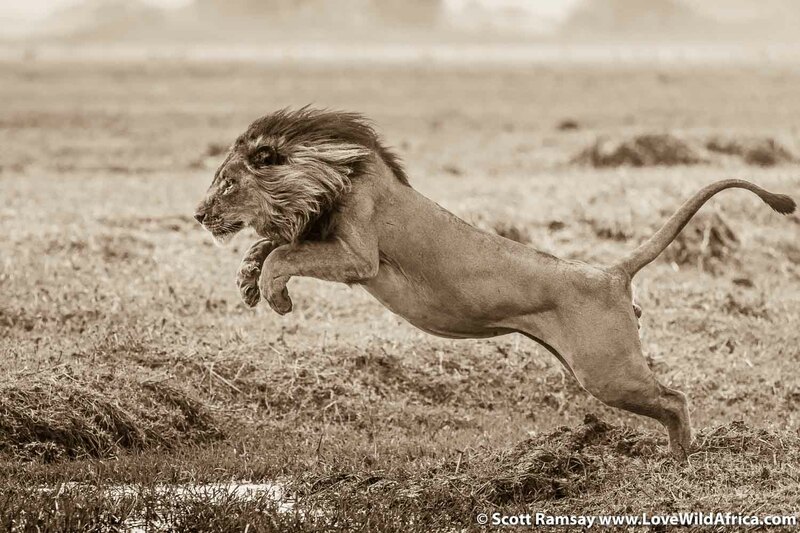 HIs photos of the lions here inspired me to do justice in my own way, photographically, to these icons of Africa. The two six-month old male cubs. Doing what cubs do. Mom doeesn’t escape the wrestling match. Who says animals don’t understand what fun is? 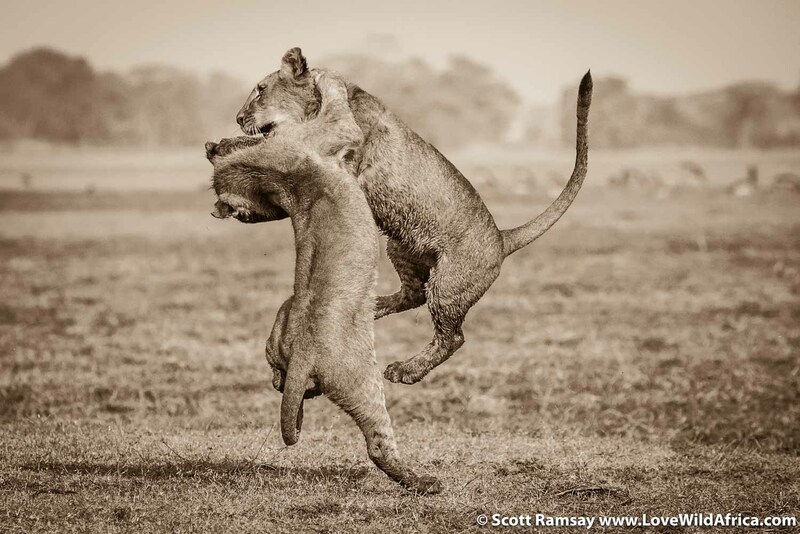 If you’ve ever watched lion cubs, all they want to do is have fun! It’s not always necessary to photograph the face of an animal to create a connection with the viewer…for some reason, this photo speaks to me. I enjoyed experimenting with a slower shutter speed on some of the photos I took. This one worked. Emerging from the tall grass. 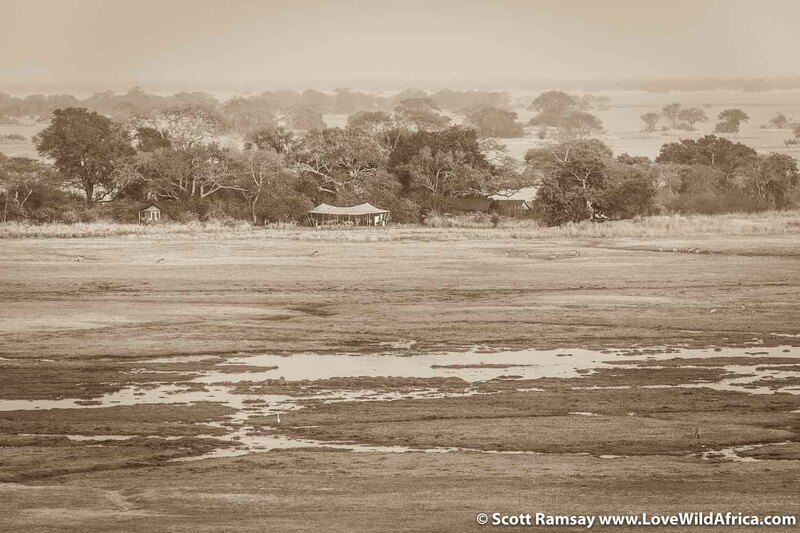 The grasslands of Busanga offer great textured backdrops for photography. 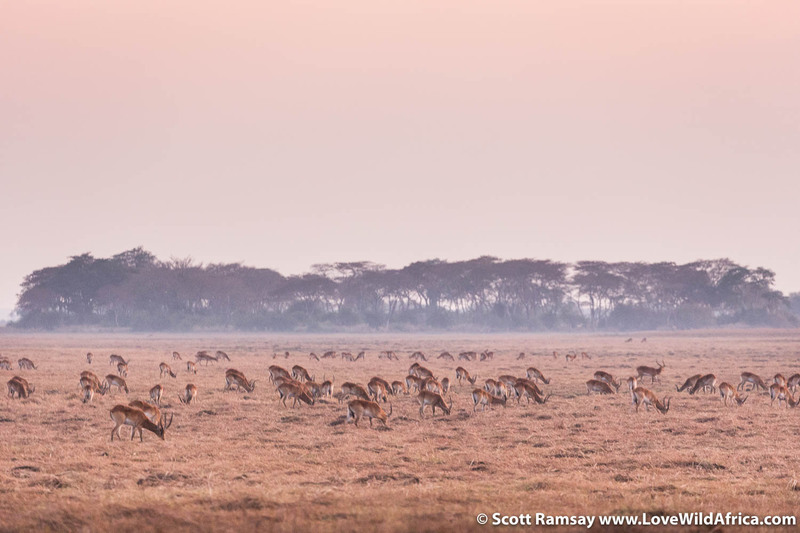 As one of the males crosses the plains, red lechwe keep careful watch. The open plains make for easy wildlife viewing. Having spent a lot of time in the bushveld of South Africa, I appreciated the uncluttered horizons. Spotted hyena at sunrise. 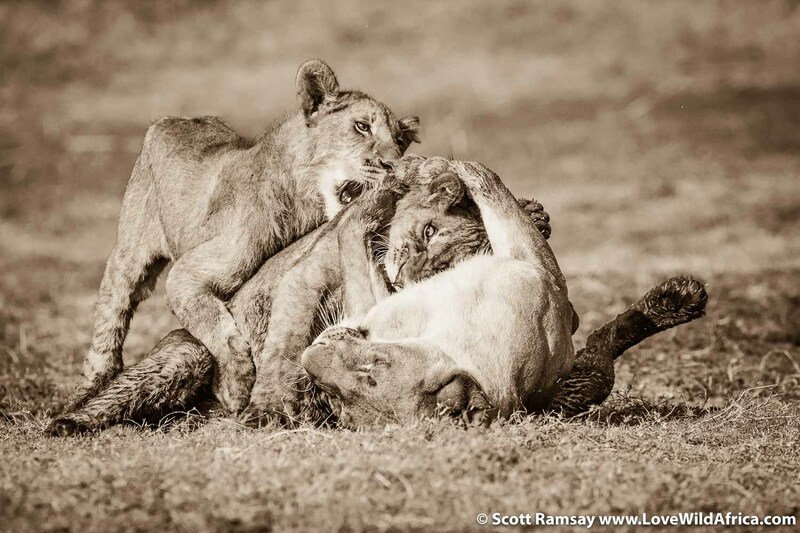 These animals have their work cut out for them, as the lions are clearly the dominant predator here. Early morning flight in Eric Heseman’s hot air balloon. One of my most memorable experiences of recent times. That big tree in the middle of the photo is a favourite vantage point for the local lions…we spent several hours on the ground in that area, admiring the cats. In summer, that tree becomes an island, as the water channels swell and flood the plains. From above in the hot-air balloon, the views of Busanga are…almost indescribable. 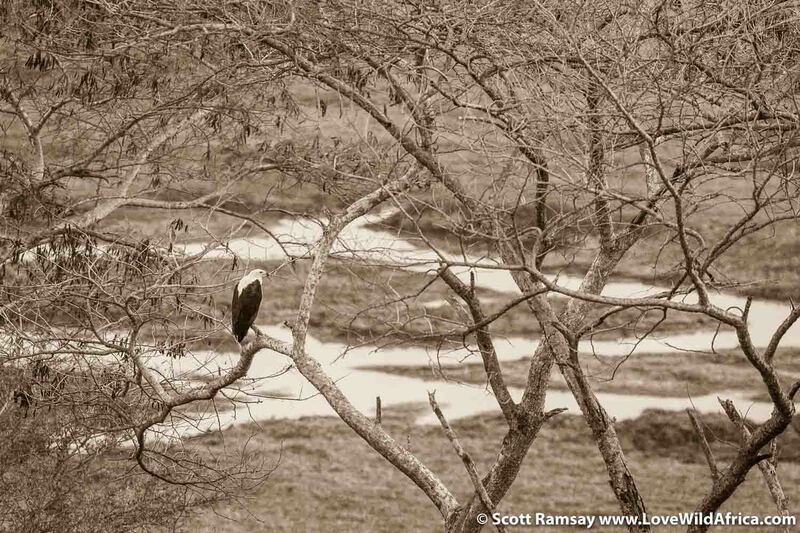 We flew low over the treetops, and said hello to this fish eagle. Sunrise view from the hot-air balloon. This landscape is not easily forgotten. This is an aerial view of Busanga Bush Camp. Take me back there soon, please. Red lechwe, seen on the plains, from the hot-air balloon. That’s not mist…but smoke from the bush fires. Still, it’s very photogenic. A game viewing vehicle coming to pick us up where Eric landed the balloon gently in the middle of the plains. The water channels are clear to see from the air…these swell to flood the plains almost totally in summer. 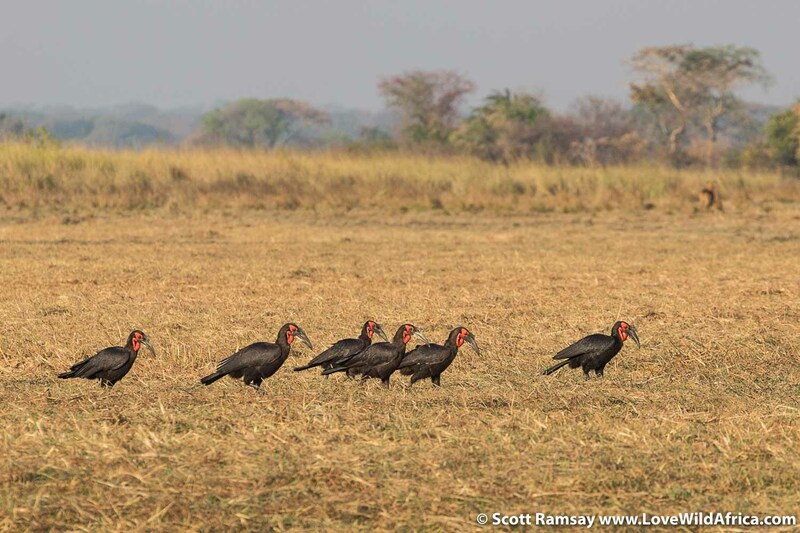 Ground hornbills walking through Busanga plains, looking for snakes or lizards to eat. 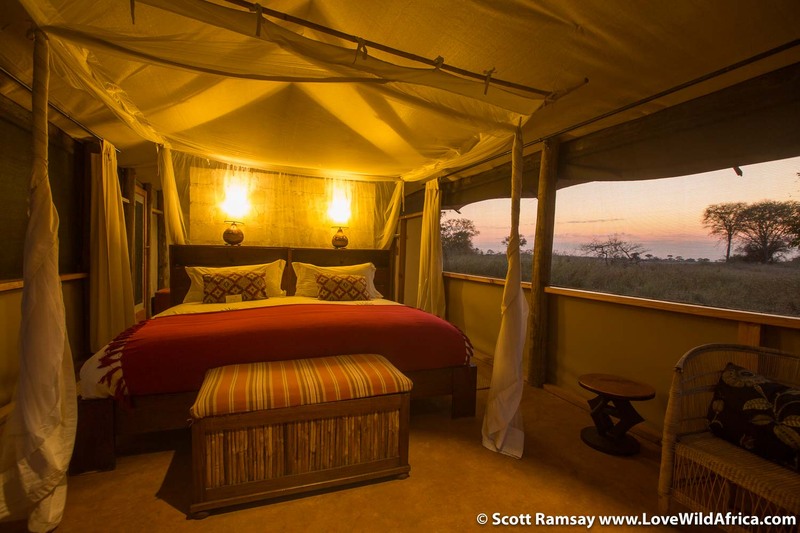 The en-suite tents at Busanga Bush Camp. Early morning on the plains, and the usual suspects are up and grazing already. 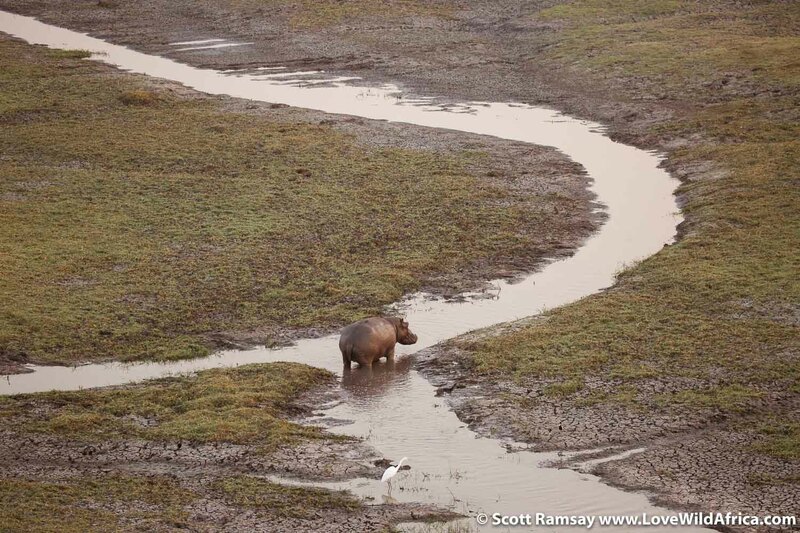 As the dry winter progresses, and the channels shrink, the hippos are forced into smaller and smaller areas. 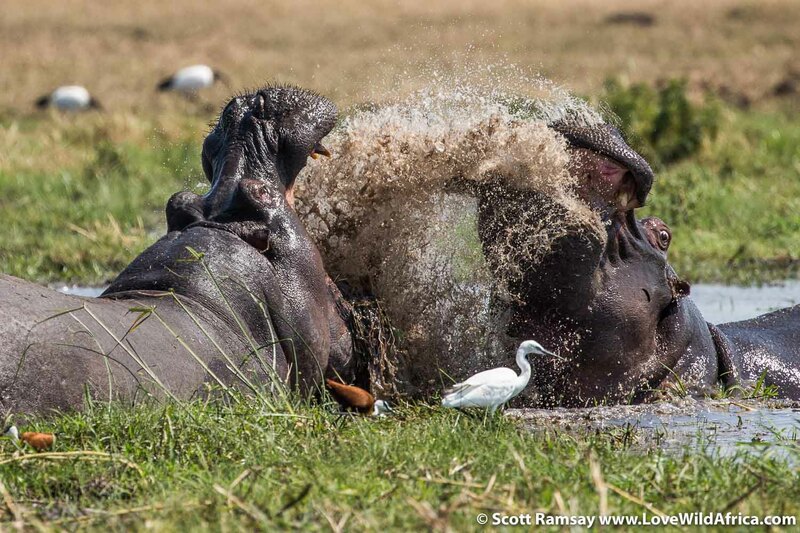 Hippos fighting over the receding waters. Newton explained that one of these was a female who wanted to get to her calf, which was nearby. But the male wouldn’t let her pass for some reason. Note the nonchalance of the jacana and little egret in the foreground. 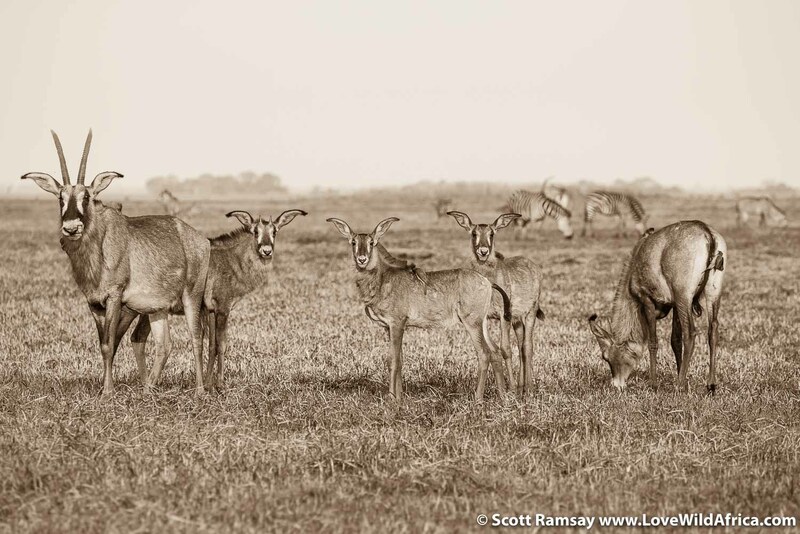 Usually rare in Southern Africa, roan antelope are common in Kafue. 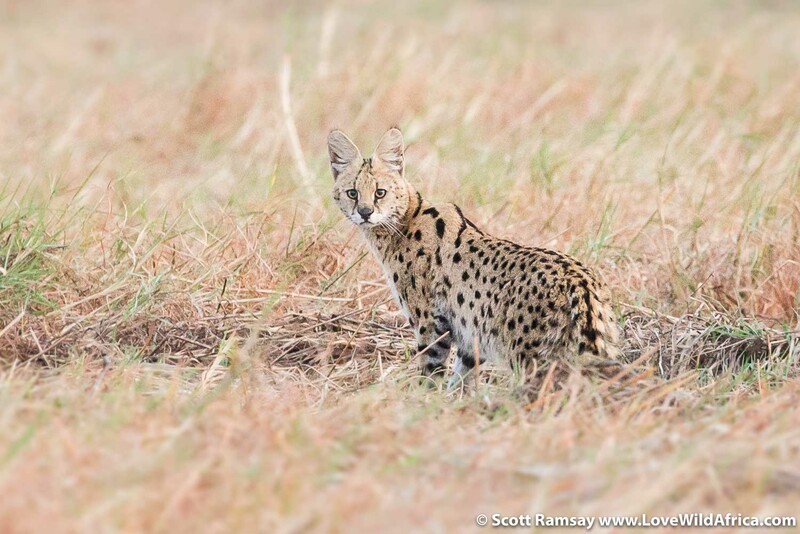 Serval in the grasslands. Striking looking, and so photogenic. Bush fire burning on the horizon. 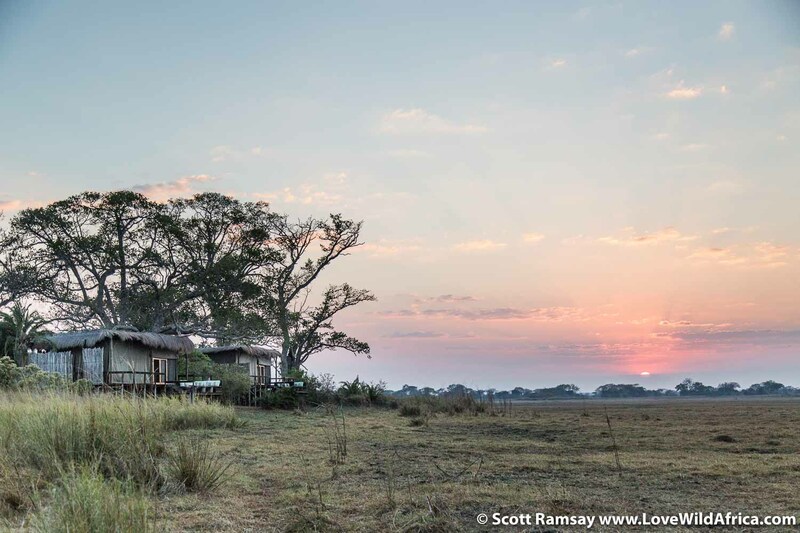 This photo was taken from the deck at Shumba Camp early one morning. Sunset over the plains. The smoke from the fires ensures that it’s always blood-red. 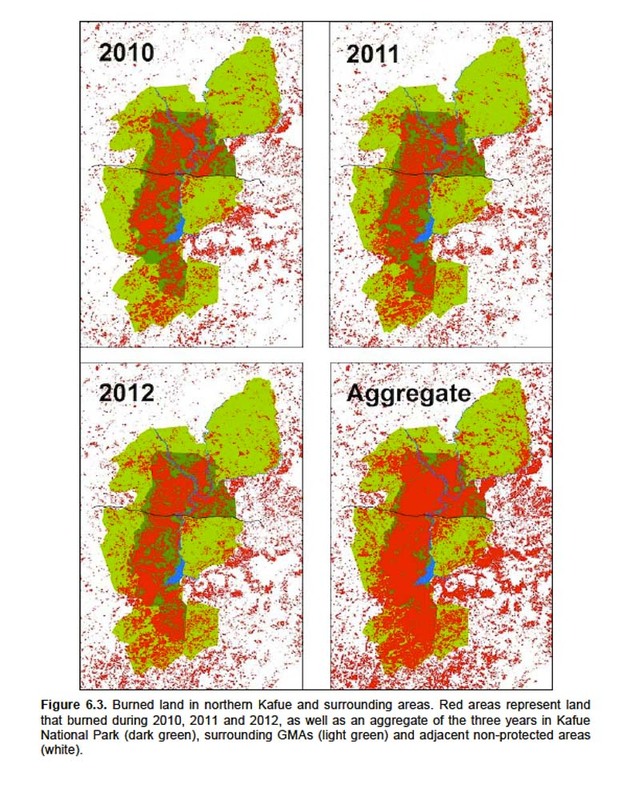 Map from Neil Midlane’s PhD thesis, showing burnt areas over three seasons in Kafue NP and surrounding areas. 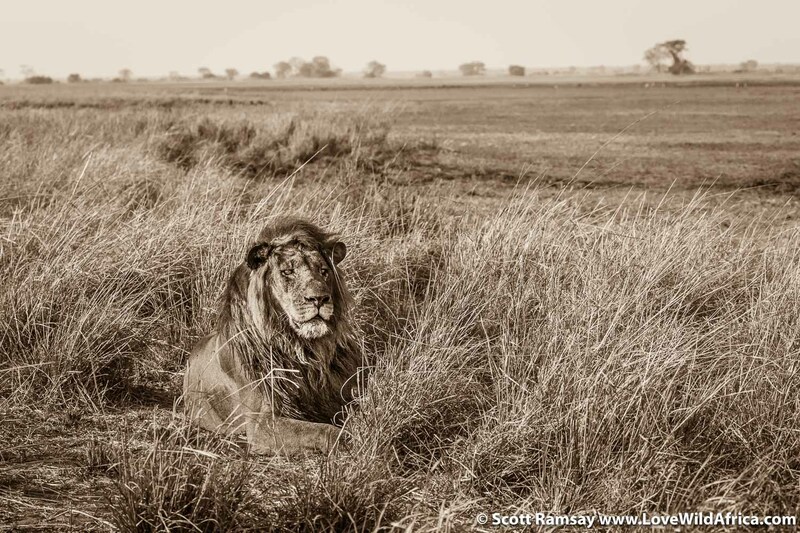 Remarkably, the park’s land is burnt more than any other…traditional fishermen in the park set the land ablaze to rid lions of their cover, and to chase elephants away. 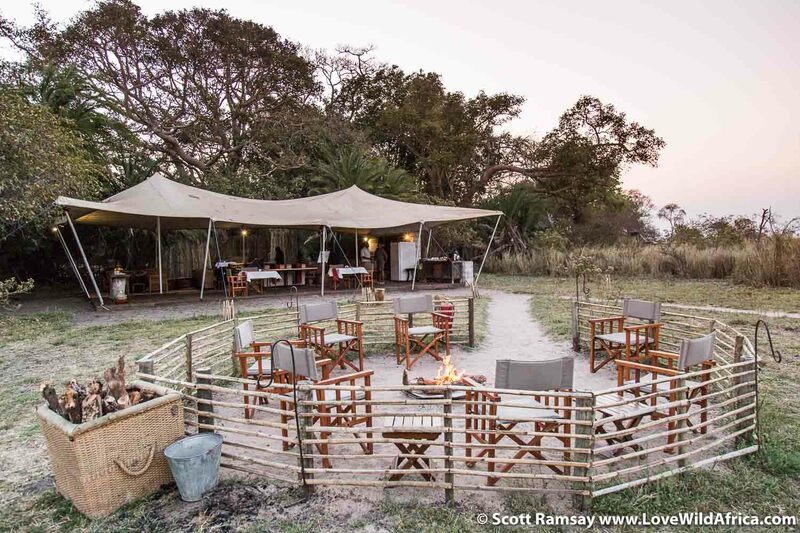 Busanga Bush Camp is the simpler, smaller of the two camps which Wilderness Safaris operate. I prefer it to Shumba, as it’s more open to the surrounding plains. 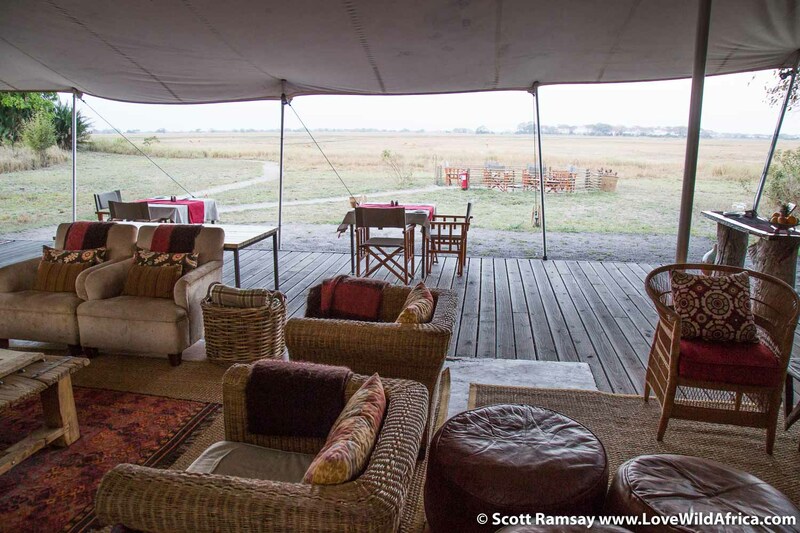 The outside fire area at Busanga Bush Camp is great for stargazing at night, and listening to the sounds of the plains. My room at Busanga Bush Camp. My view from my bed at Shumba Camp, which is raised off the ground and accessed via boardwalks. View of Kafue River from the air, as we flew into Busanga. Great article, absolutely fantastic images. However Wilderness Safaris do not have exclusivity in Busanga. Mukambi Safaris operate their ‘Plains Camp’ there, and a number of operators conduct mobile safaris based in Busanga. As a National Park anyone can drive around Busanga. 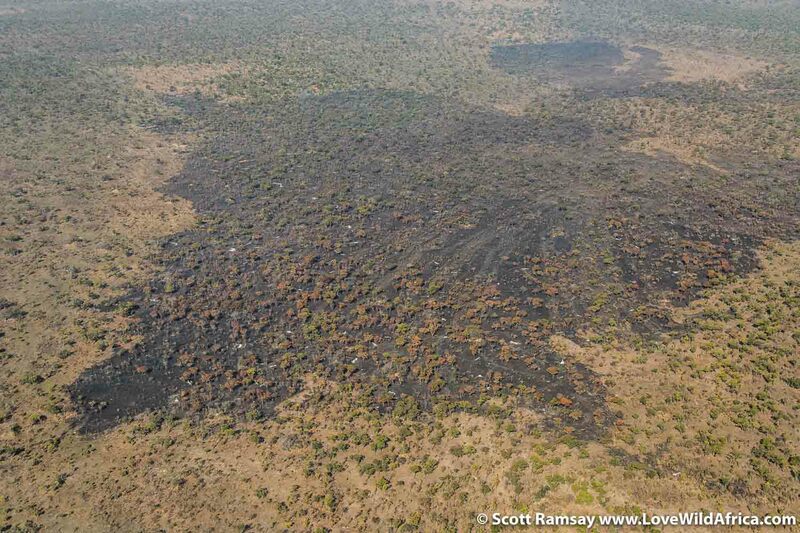 Great work and very good that you are flagging up how much damage late fires can cause in the Kafue. Thanks Gilmour, will amend! Appreciate the feedback.